Okay, so I was inspired to make cookies by two things. The first has to be Waitrose advert where she is making biscuits. 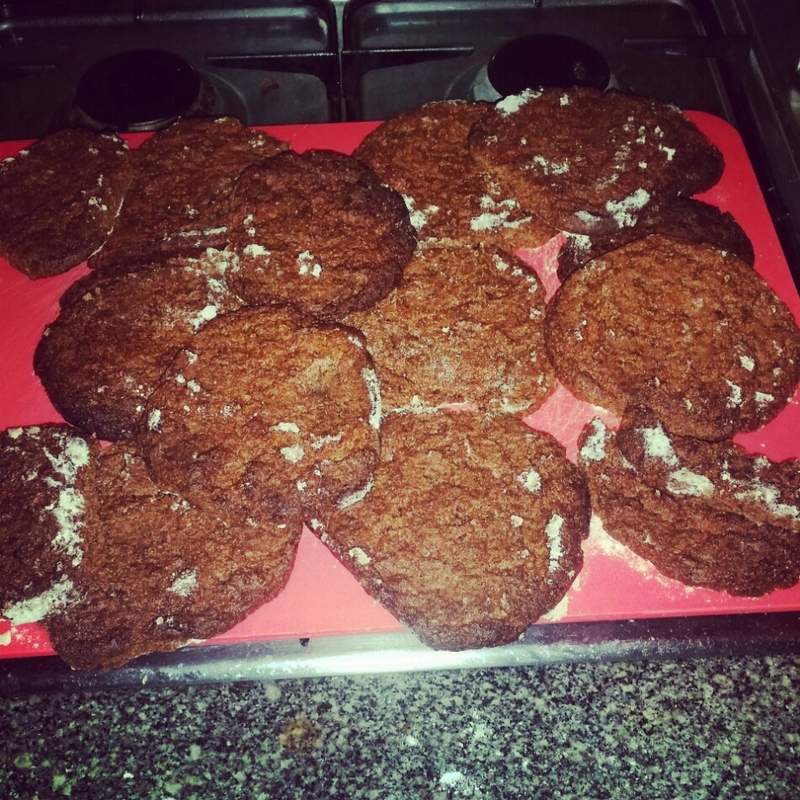 So often have I made cookies and biscuits and them not gone quite how I wanted. The second is Junior Masterchef. One child made chocolate chunk cookies and I realised I had ingredients to give some sort of cookie a go. After making Christmas cakes a while ago I have plenty of spare flour and sugar hanging around. Somehow I don’t seem to have any dried fruit left so decided to to a chocolate powder and golden syrup cookie instead. The chocolate helps to counteract the sweetness of the golden syrup. 1. Mix the margarine and sugar together until combined. 2. Add the golden syrup and mix it in well. The mixture will seem quite runny now. 3. Mix the flour and chocolate powder together, in the weighing scales will do. Sieve it into the sugar mixture slowly occasionally folding it in. 4. Heat the oven to 180 degrees (fan assisted). 5. Sprinkle some flour on a couple of baking trays. Roll small amounts of the slightly sticky mixture up into balls and put on the baking tray – making sure you leave enough room for them to naturally fall into a cookie shape! 6. Put in the oven for about 15 minutes. After this have a look at them when you open the oven. If they are still bubbling give them another five minutes. Of not turn one over and see if they have gone harder around the outside but are still soft (to a reasonable level) in the middle underneath. 7. Put on a cooling rack and then tuck in. This entry was posted in Food and Drink, Recipes and tagged atmosphere, baking, blogger, breakfast, brunch, cake, childhood food, childhood memories, chocolate, classic food, comfort food, Cook, cookbook, cookies, cooking, cooking tips, cost, dairy, dessert, desserts, Dining, eating, family, family friendly, flour, food, food pictures, fresh, golden syrup, home cooking, Hot, Lifestyle, margarine, masterchef, Recipes, snacks, sugar, sweet, tasting, waitrose. Bookmark the permalink.